At times, the ‘being all obscure for the sake of it’-attitude that characterises many a black metal band has its advantages. Take a look, for instance, at bands that only release their music on tape. Initially, the idea of listening to cassettes may not seem all that appealing due to the shakey sound quality and the difficulty you will likely experience trying to find the right song, but this outdated medium still has a certain charm over it. Once again, music is an experience rather than the background activity it has become over the years. On a more economically relevant note, cassettes are excellent for the skinflints among us (4 euros for an EP instead of 10), and the artist reduces the chance of his work ending up on crappytorrents.ru within 2 hours after its release, further promoting the romanticism of the music. This is one of the reasons why Royaume Perdu by the French band Triste Sir is such a special object to me. This demo EP has only appeared on cassette (and apparently on CD-R, but I’ve never seen it anywhere), it’s very difficult to obtain at this point and, for as far as I know, there are no downloads for it. It’s not like I get off on rare objects, but it does give me a special feeling knowing that I’m listening to something that barely anyone knows, and that in case of the tape ending up missing or broken, the party’s over. This makes me appreciate every listening session all the more. And aside from all that, it’s also just a mighty fine piece of black metal. Triste Sir was founded in 2003 and the band has released 3 demos since then (among which a split with Sarcueil), with 2008’s Royaume Perdu being the latest. The band hails from Southern France and has adopted a style rather typical for bands from that region: melancholic mid-tempo black metal that can successfully be melodic and atmospheric without resorting to the feared Casio keyboard overdose. 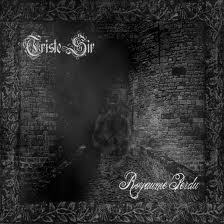 Still, Triste Sir shouldn’t be put in the same category as bands like Celestia and Mortifera, seeing as Triste Sir’s approach is clearly more raw and aggressive, giving the band a bit of a darker, more mysterious vibe than the more famous French black metal acts. Royaume Perdu starts with a short keyboard intro, which may momentarily trick the listener into thinking that the rest of the music also relies heavily on this instrument. This couldn’t be further from the truth, however, as at the core of each of the subsequent tracks are in fact the solid guitar and bass work by Franck aka Fk0 (from the aforementioned Sarcueil) and Indria (known for his work in Peste Noire, among others) respectively. The guitar riffs are relatively simple, but succeed in evoking the melancholic atmosphere that defines the sound of this demo. They’re also quite well-executed, which is noticeable depite the raw production. While the use of lead guitar is rare, some well-timed high notes (I wouldn’t go as far as calling them actual solos) give certain moments in some songs an overwhelmingly climatic feel (this is particularly evident on Nightmare). Indria’s basslines on Royaume Perdu may not be as noteworthy as his recent contributions to Peste Noire, but they still make for a few of the demo’s highlights (especially on the track Dernière Valse), and the quality of the bassplaying in general far exceeds anything you’d expect from a raw black metal demo such as this. The photos on the tape were so ‘lo-fi’, that I had to resort to using one from a Peste Noire session. The compositions on Royaume Perdu are not too complicated, but they are still well-structured and functional, most notably when it comes to capturing a certain atmosphere. 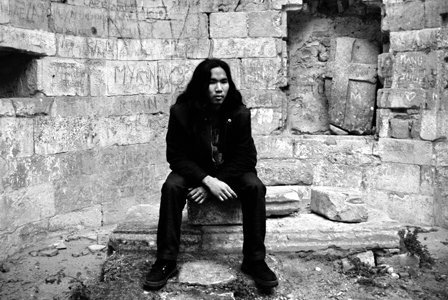 Much like bands such as Darkthrone, Triste Sir proves that you only need a few good riffs for a successful black metal song. The occasional use of melodic/acoustic breaks (like the ones on Dance of Cursed Souls, Escape From Reality and Nightmare) provides the band with a certain individuality that is hard to capture. Because, while not too much out-of-the-ordinary things happen on this demo and no completely new elements are introduced, Triste Sir has still managed to find its own niche. The combination of aggression and melody gives the band a special, mysterious sound that seems all the more peculiar when the rough, unrefined production is taken into account. And it’s exactly the strangely familiar, but awkward and undefinable sound that characterises this demo the most. With a play time of about 20 minutes, Royaume Perdu mainly leaves the listener craving for more. The compositions are pretty consistent in terms of both structure and sound, making this tape – going by the standards of the genre – relatively easy listening. I’d put it on repeat if it weren’t for the fact that tape recorders apparently think they’re too cool for such modern endeavours. It is difficult to tell whether Triste Sir will ever release a full-length album, but taking their discography thus far into account, as well as the silence that has been surrounding the project over the past three years, it could well be that this will remain one of those ‘demo bands’. I’d personally love to see a full-length album by Triste Sir. As long as they release it on tape. That’s a nice review 😉 thanks!